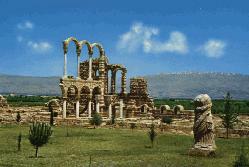 About 55 km east of Beirut, Anjar was once a commercial center on the caravan route as well as a summer and hunting resort for the Umayyad dynasty. The walls of the Caliph's palace are still largely intact, with clues to the former presence of forty towers. There are indications, however, that there may once have been a Roman castle on the hill as there are traces of fluted columns.